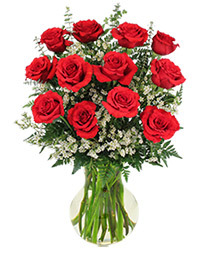 2 dozen Long Stemmed Premium Red Roses with greens and light accents presented in a lovely vase. Upgraded price includes luxury greens and accents. Romantic Red Freedom Roses presented posy style ... with shades of grey seeded eucalyptus and classy pittisporum foilage ... in a funky ginger jar vase. This is a beauty! Nothing says "I Love You" more clearly than the rose. Whether it's a first date, first anniversary or the fiftieth, BLOSSOMS 'N SUCH can help you find the perfect gift of roses for your sweetheart. Browse our selection online or call us for custom a rose creation. 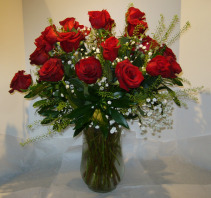 No matter where you need to send roses, BLOSSOMS 'N SUCH in Parksville can help!